Give your fisherman the gift of Canyon Reels! This e-gift certificate can be used toward anything in our store. 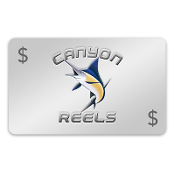 Choose an amount and we will send you a one-time-use code good on any future CanyonReels.com purchase.